1 of 5 Heat oven to 375 degrees . Coat 13 x 9 x 2-inch baking dish with nonstick cooking spray. 2 of 5 In large skillet, heat oil over medium-high heat. Add peppers, ground beef and garlic salt; cook, stirring to break up clumps of beef, until the peppers are soft and beef is no longer pink, about 5 minutes. Drain off any excess fat from skillet. 3 of 5 Remove pizza dough from tubes. Cut the dough crosswise into 1/2-inch-wide slices, then cut each slice into quarters. 4 of 5 In large bowl, toss together dough pieces and salsa. 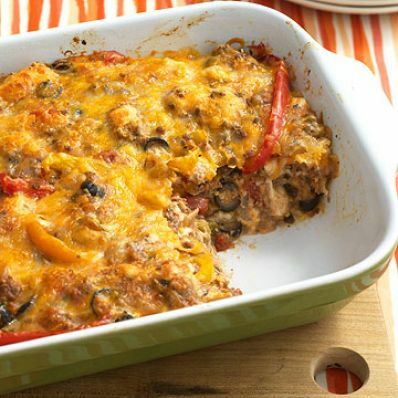 Add cooked meat mixture, 2 cups of the taco-cheese blend and olives. Scrape mixture into baking dish. Sprinkle the remaining 1 cup taco-cheese blend over the top. 5 of 5 Bake at 375 degrees for 30 minutes. Sprinkle scallions evenly over the top. Bake an additional 5 minutes.